As the Vatican year winds down, the Holy See's diplomatic apparatus is closing out for the summer on an impressive high note... or a few. 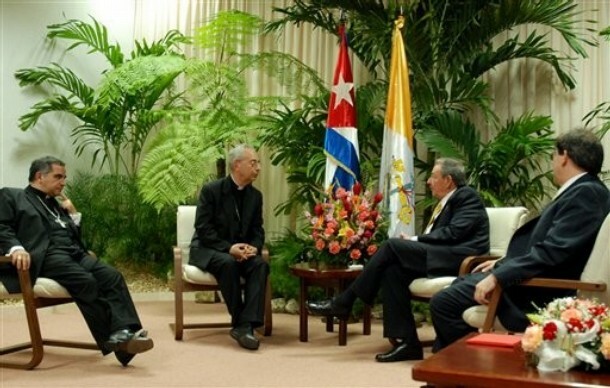 For starters, building on the recent inroads made by the Cuban church with the island's Communist government, earlier this week Rome's "foreign minister" Archbishop Dominique Mamberti visited Havana, where he met with President Raul Castro (above) -- an occasion for which, press reports noted, the usually fatigue-clad brother of Fidel conspicuously "suited up." Then, earlier today, a years-long path to full diplomatic relations reached its close at simultaneous ceremonies at the Home Office and the Kremlin as the freshly-elevated Russian Ambassador Nicolai Sadchikov and Apostolic Nuncio to Moscow Archbishop Antonio Mennini respectively presented their credentials. And now, in another signal breakthrough, after a bilateral commission of top officials representing the Vatican and Vietnam met this week, the two sides agreed to the appointment of a "nonresident Representative of the Holy See" to Hanoi. In its announcement this morning, the joint working-group noted the progress accomplished by "the address of His Holiness Pope Benedict XVI during the last Ad Limina visit of the Vietnamese Bishops and the Holy Father’s Message to the Catholic Church in Vietnam" last November, as the country's 5.6 million Catholics (roughly seven percent of Vietnam's population) observed a Jubilee Year commemorating the 350th anniversary of the church's first general oversight there. As the commission noted that "these teachings" of Benedict's "would serve as an orientation for the Catholic Church in Vietnam in the years ahead," it's especially significant that both papal texts spoke of the importance of a "healthy collaboration" between the church and a government viewed with suspicion among many Vietnamese Catholics amid instances of persecution that've emerged over recent years. While the reports include the arrest and assault of ecclesial critics of the regime and the fining of Catholic families who've exceeded the government's mandatory two-child policy in observance of the church's teaching on artificial contraception, the signal moment of the recent church-state clashes came in 2008 as the faithful held demonstrations calling for the restoration of church property in the capital, Hanoi, which had been seized by the state. The regime's push to quash the prayer rallies saw the children of demonstrators threatened with grade penalties or expulsion from school, the Hanoi bureau chief for the Associated Press beaten up after he went to cover a demonstration, and a concerted campaign to discredit the city's archbishop, Ngo Quang Kiet, who indicated his willingness to be jailed in defense of his flock's right to prayerfully protest. Having been kept for a time under house arrest "with the unconcealed objective of forcing his resignation or removal," late last year the 57 year-old archbishop -- named to the capital in 2005 -- announced that "deteriorating health" necessitated his resignation. As the rationale quickly became viewed as a diplomatic veil to seek a successor more amenable to the government, in April Rome named a 72 year-old prelate, Bishop Pierre Nguyen Van Nhon, as Ngo's coadjutor. The archbishop's resignation was accepted three weeks later, and his successor will be among the 38 archbishops receiving the pallium from the Pope at Tuesday's celebrations of Saints Peter and Paul. In his ad limina speech to the Vietnamese bench -- delivered a year ago tomorrow -- Benedict told the prelates, "You know, as well as I do, that healthy collaboration between the church and the political community is possible. "In this regard," the pontiff explained, "the church invites all her members to be loyally committed to building a just, supportive and fair society. Her intention is certainly not to replace government leaders; she wishes only to be able to play a just role in the nation's life, at the service of the whole people, in a spirit of dialogue and respectful collaboration." While the diplomatic status the Vatican representative to Hanoi will enjoy was not clarified in this morning's announcement, today's completion of ambassador-level relations with Russia now gives the Holy See full representation in 179 countries, plus its state-level observer status at the UN and its "special relations" missions at the European Community and with the Palestinian Authority.